grandma's cookie jar: One Blanket Down . . .
For the past couple months I've been crocheting every chance I get. Why, you ask? Because I've been making blankets for Josiah and Caleb for Christmas! Josiah's blanket is finished . . . unless he wants more one-eyed monsters or trucks or boys on it! Since they will be spending a few days at my house, if he wants more of any of these, I'll make them and add them to his blanket while he is here! His blanket has a sun in the sky - and I'm adding a heart to the bottom corner. It is a really simple pattern - I just double crocheted in a simple zig-zag pattern as wide as I wanted it and then until it was as tall as I wanted it. I used two strands of yarn to make it a heavy, warm blanket . . . we do live in Michigan! I changed yarn throughout as I used up what I had. I did this to give it colors and textures and make it more interesting and fun! After I had the blanket the size I wanted, I double crochted around for a few rows to add more color and then reverse single crocheted around the edge for the final edging. Very simple blanket; but it did take some time to make! 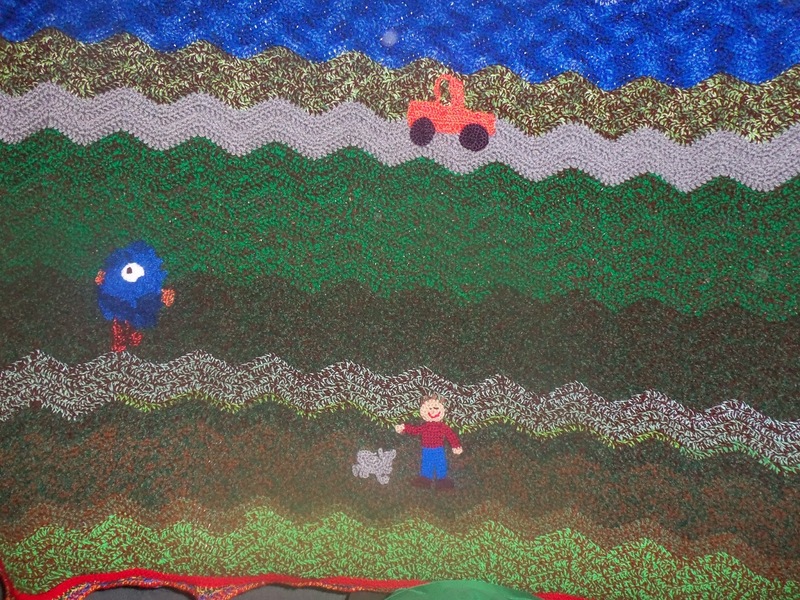 I crocheted "free-style" to make the sun, truck, one-eyed monster, boy (Josiah) and puppy (Gimli). 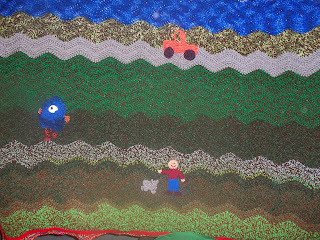 Caleb's blanket is almost finished . . . and definitely will be finished by tomorrow! I'll post a photo of it tomorrow . . . it has space ships, aliens and I think I'll try to make a planet for it, too!